French toast is best served hot, but gets cold quickly. If you are hosting or attending a large potluck where food will be on a buffet, it will be difficult to keep the French toast warm, even if you keep it in the oven until right before serving. Like other hot foods, French toast must be kept at a temperature of at least 140 degrees Fahrenheit to prevent bacteria from forming. Serving plates with their own heat source or that retain heat well will keep your French toast warm and safe to eat. Use an electric warming plate. If the serving table is near an electrical outlet, plug in a warming plate, place the French toast on a heatproof plate and put the plate on the warming tray. Do not use plastic or paper plates, however, as they will melt or burn. If you do not have a warming plate, wrap an electric heating pad in a towel and place the plate of French toast on top of it. Use a chafing dish. Used primarily in professional settings, chafing dishes are metal serving pans with a bottom pan that holds hot water to keep the food in the top pan warm. It typically includes a holder for canned heating fuel that keeps the water hot, which in turn, keeps the food hot. You can purchase an inexpensive aluminum disposable chafing dish at a party supply store to keep your French toast in. Disposable chafing dishes are also more portable if you are traveling to the potluck. 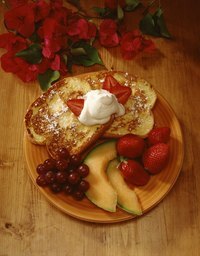 Serve the French toast on a warmed, ceramic serving dish. Ceramic retains heat longer than other materials such as metal or glass. Heat the ceramic serving dish in the oven at about 200 degrees Fahrenheit and add the French toast to it as you cook them. If you are traveling with your French toast, ask the host if you can keep the French toast in the oven until serving time. Place the hot ceramic dish on trivets on the buffet table and keep it partially covered with aluminum foil to hold onto the heat for as long as possible. French toast should be cooked to an internal temperature of 160 F to ensure the eggs are sufficiently cooked. Do not serve French toast or any hot food that has been at room temperature for more than two hours, according to the U.S. Department of Health and Human Services. Discard any remaining French toast after two hours if you cannot determine that it has maintained a temperature of at least 140 F.